I have known Dori Mintzer for awhile now and in the fall of 2017 I finally had the pleasure to meet her in person. We were both presenters at a Boomer Conference in Portland Maine. We had a wonderful lunch sitting outdoors enjoying a beautiful fall day. She gave me this book and signed it for me “Enjoy your journey“. 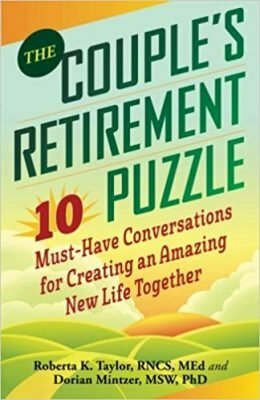 Dori and Roberta have written a very upbeat, optimistic, practical book for anyone approaching retirement or in retirement now. Their advice is all based upon breaking this time of our lives down into essential parts and then communicating with our partners. The cornerstone of their advice is communication and at the end of each chapter are prompts to talk through the essential topic of that chapter. First time alone to write and process. And then time together to listen, really listen and understand what your partner is saying and thinking. Then to work on a plan -and compromise – if needed. It ends with a very practical worksheet “Creating Your Shared Vision” and tons of resources to help anyone move beyond the book. The book covers topics from; If, when, and how to retire; Money; Changing Roles; Relationships; to Choosing where to live, and more. They break each topic down to the essential parts that should be discussed and examples to help you understand the why behind each. If you are facing retirement soon and want to know what needs to be thought of and discussed, this is a great book that I highly recommend to you.